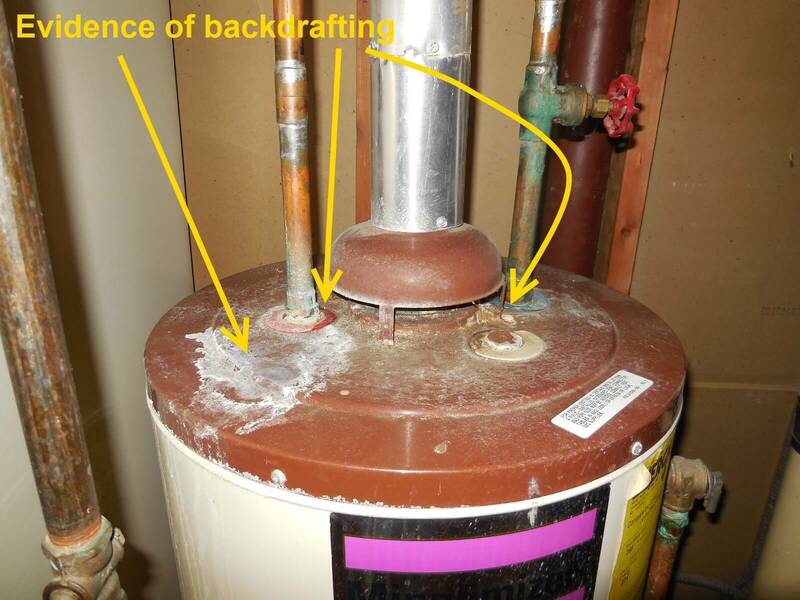 Backdrafting at a water heater is a common defect identified during home inspections, and it’s almost always a condition that the homeowner or occupant is not aware of. 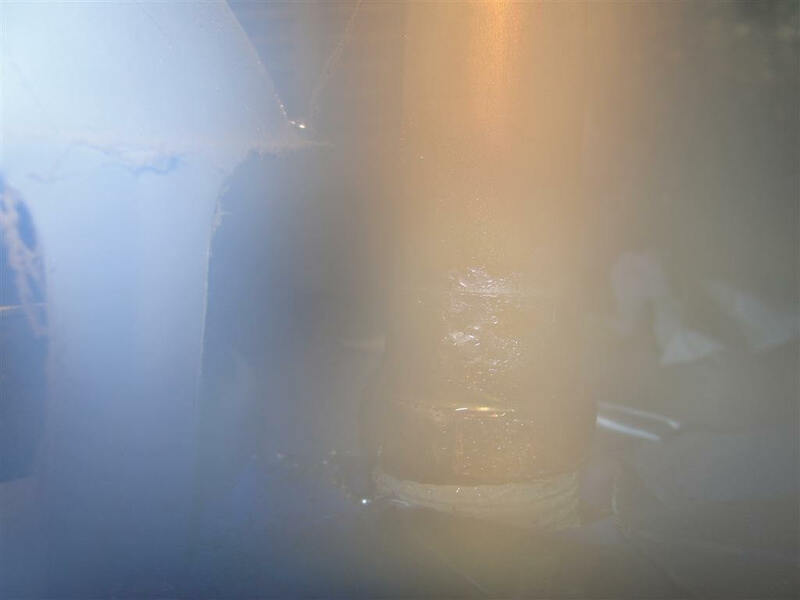 This happens when the exhaust gases from an atmospherically vented water heater spill out into the room, rather than safely leaving the house through the vent. 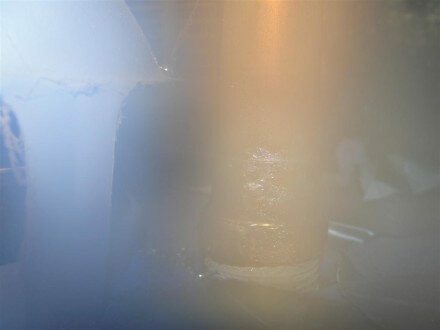 Exhaust gases contain carbon monoxide and high levels of moisture, so this is always a condition that should be corrected. 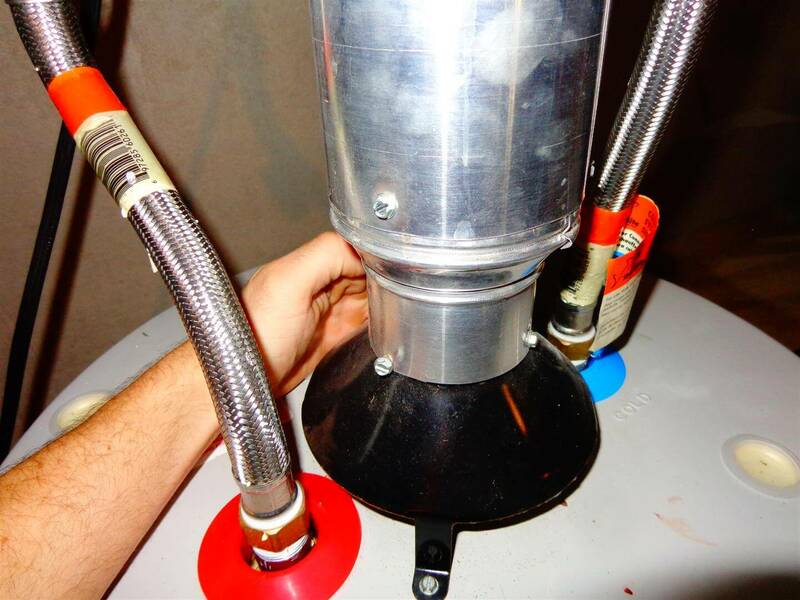 An atmospherically vented water heater is a type with a draft hood, which relies on gravity to get the exhaust gases out of the home. Exhaust gas is hot and therefore lighter than the surrounding air, which is what allows it to rise up the vent and out of the house. These are very simple devices that require no electricity to operate, however, this isn’t a very reliable draft method. Today I’m going to share some clues that could indicate a problem with a water heater drafting properly. Melted plastic at the draft hood. When the plastic at the top of a water heater is melted, it’s pretty much a guarantee that the water heater has backdrafted. I’ve heard some folks claim that the plastic melted when the water heater was being installed, because someone got too close to the plastic with a torch while soldering the pipes. That’s possible if the solder joints are very close to the water heater tank, but very highly unlikely, especially when the part that’s most melted faces the draft hood. 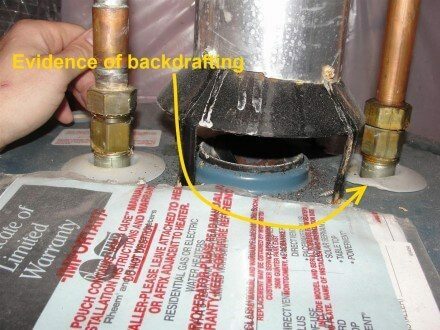 Backdrafting exhaust gases can condense at the top of the water heater tank. 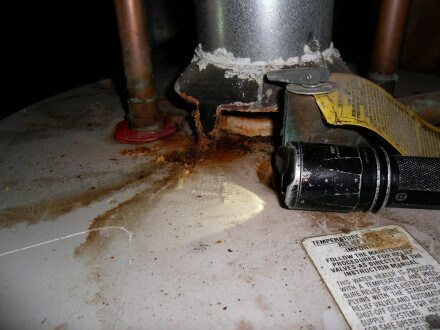 Over time, this corrosive condensate will begin to corrode the top of the tank. 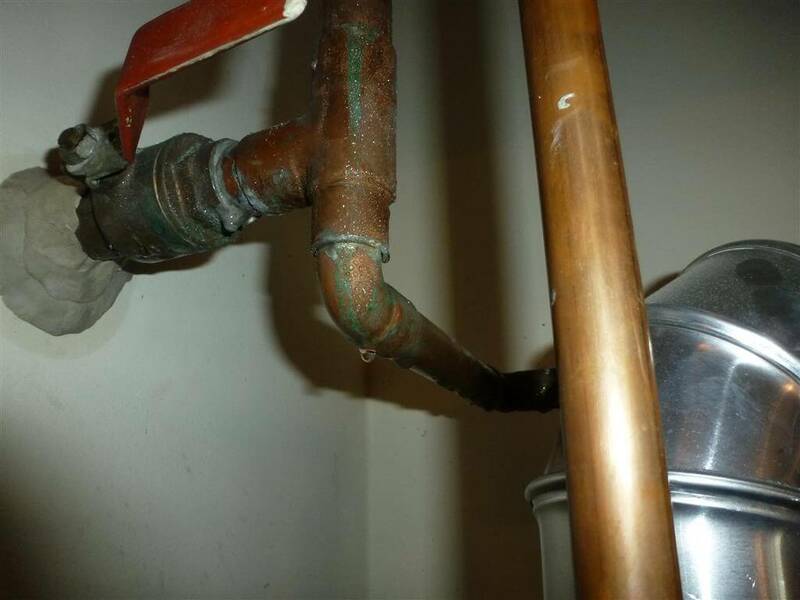 A leaking shutoff valve can also cause corrosion at the top of the tank, but that type of corrosion is easily distinguishable back corrosion caused by backdrafting because the worst area will be located directly below a valve. If you can see condensation at the top of a water heater tank, you’re basically watching the water heater backdraft. The photo below shows moisture, rust, and melted plastic at the top of the water heater. Click the photo to see a large version, showing this water heater backdrafting like crazy. After a water heater has backdrafted for a while inside of a utility room, there will probably be heavy condensation on the cold water pipes. It’s typical to see condensation on cold water pipes during the summer, but a backdrafting water heater will make it dramatically worse. The vent connector at a water heater needs to pitch upwards towards the vent, and should ideally not have any quick turns, especially right at the draft hood. If you find these types of clues, there might be a problem with the water heater drafting properly. Run hot water at a bath tub or laundry sink long enough to get the water heater to kick on. This creates a worst-case scenario for the water heater, but it should still draft properly under these conditions. Before testing the water heater draft, I let the burner run for a little bit; sometimes a water heater will initially backdraft for a minute or two, but will start drafting properly once the vent connector warms up enough. I have several different tools that I can use to check for proper draft at a water heater if I’m feeling fancy, but there’s really no need. To check for proper draft, I simply cup my hands around the draft hood without actually touching it. If the water heater is backdrafting, I’ll feel warm, moist air coming out of the draft hood. If I want visual evidence to put in an inspection report, I can hold a mirror up the draft hood and take a picture of the mirror getting fogged up. The photo below shows a mirror that happened to be sitting on top of a backdrafting water heater during an inspection; I had to take a photo of that, right? 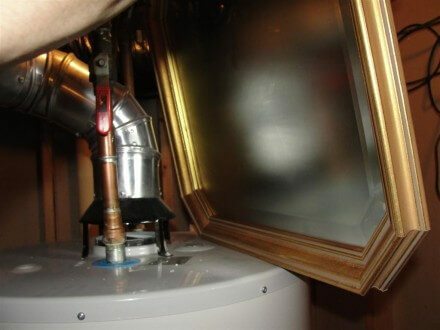 Another easy way to get visual evidence of a backdrafting water heater is to hold a camera close enough to the draft hood to allow the lens to get fogged up from the backdrafting flue gases. Powerful stuff, huh? If there happens to be cobwebs hanging down from the draft hood, they can give a nice visual indication of backdrafting. 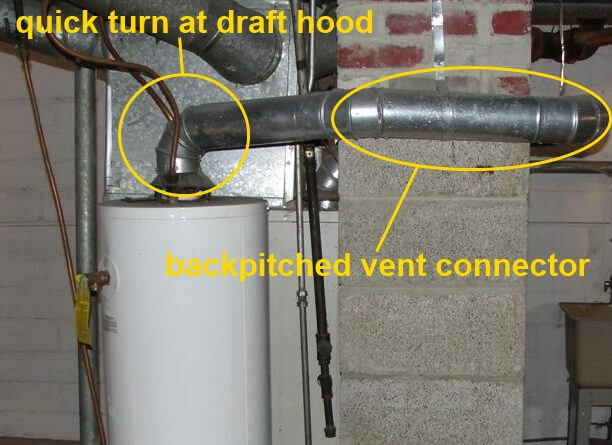 The short video clip below shows a water heater backdrafting for about twenty seconds before the vent warms up. My camera lens even fogs over for a second when I get it too close to the draft hood. Don’t mind the friendly cats making noise in the background. Next week I’ll have a follow-up post on the causes of water heater backdrafting and what can be done about it. I’m in a condo, was gone for a few days, then came back on Saturday. Sun. a.m., I took a shower, and didn’t notice anything wrong. Mon. a.m., no hot water from bathrm. sink, and when knob was turned to “hot,” water flowed freely, even though it was cold water. Later, I turned knob for hot water at kitchen sink, and there was just a trickle, but full force for “cold” knob. Then, after checking sinks in two bathrms., there was just a trickle when the knob was turned to “hot.” The pilot to the gas water heater is lit. I drained some of the water from the tank using the knob on the front, and it was piping hot. I talked to three other condo owners, and their hot water is running fine. By the way, it was about -12° today, and I’m on the top floor. If my pipes go into the attic, could there be ice in them? We have an “orphaned” water heater (the setup was there when we purchased the house not that long ago (this is our 2nd winter here). The inspector back then did point out some evidence of back-drafting on the water heater, but at the moment it was drafting fine. He said the issue could’ve been corrected prior to inspection or, perhaps, was only happening under certain conditions… I promptly forgot about that conversation. A few days ago, by chance, I noticed that the heater was firing, but the flue was dead-cold… After some observation and experimentation, I can conclude that, in weather conditions colder when our usual mild Mid-Atlantic winter and with all doors windows closed, water heater is not able to establish the draft. If a window is opened for a few seconds, then it starts drafting fine and continues to do so even after the window is closed. So, I am contemplating either installing draft inducer on the flue, or “fan-in-a-can” to pump outside air in when the heater is running. Either – is to be activated by a pressure switch attached to pressure tap on gas control valve. I expect either solution to remedy the problem. @Mike – I’m not familiar with a fan-in-a-can. If opening a window solves your issue, I would expect a passive combustion air duct would be enough to correct your issue. What happens when you turn on other exhaust fans in the house? It certainly sounds like you need combustion air brought it. I’d go that route. Only In the winter, and only when the wind blows a certain way, the pilot on my water heater always goes out. This is quite an annoyance, if you can imagine. What could be causing this? Would a blanket help? The heater is in a closet outside, attached to my deck, with the back wall of the closet attached to my living room. There are no windows. Only the door to the closet, and vents into the living room. @Sherrie – it might be a downdraft. Do you have a UL listed cap installed on the vent? If not, start with that. Wish I’d seen that earlier. Just spent 1600$ on a new installation with proper venting. I called Direct energy because of heat build-up in the furnace room and told me I had to upgrade for a direct venting unit (600$ Extra) and almost doubling my monthly rental from 15$ to 26$. BTW they red tag my tank. They never offered to install an air intake system. Very clear to me they were after my money. Called two local companies to evaluate my issue and both ageed with the backdraft but could easily be rectified. Direct energy did not want to go with this approach saying it would not work. Lesson learned, do your research before calling your rental company. I am having this problem with my water heater. will make the water heater vent back draft. dryer is it stops immediately. I just had the installer of the water heater out to check on this condition a few weeks ago and he had no clues to help me figure this out. He had never heard of back drafting. I am waiting for your part 2 of this to help me with a long term plan instead of cracking the window. How about holding a BIC cigarette lighter at the hood? Cigarette lighter at hood, lit match at the hood… sure. I’d put that somewhere in-between my method and the ‘fancy’ method.